Inherently balanced ATUs reported an experiment to measure the balance of a simulation of Cebik’s “inherently balanced ATU”. 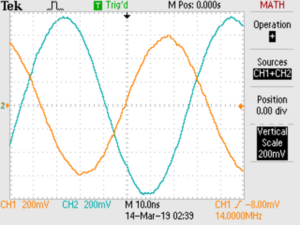 This article reports the same asymmetric load using the MFJ-949E internal voltage balun. 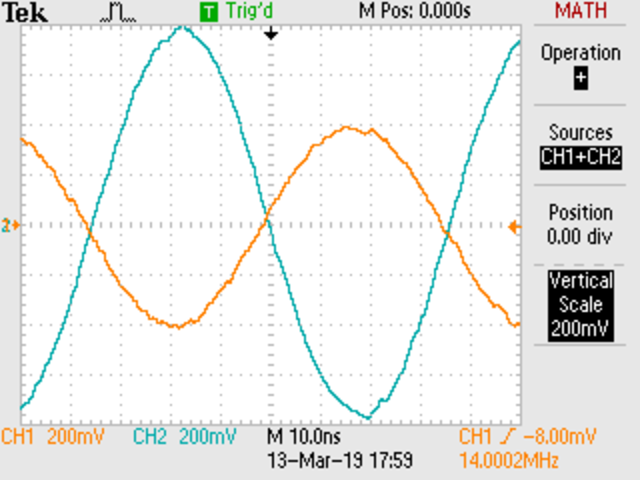 The test circuit is an MFJ-949E T match ATU jumpered to use the internal balun and resistors of 50Ω and 100Ω connected from those terminals to provide a slightly asymmetric load. The voltage between ground and each of the output terminals was measured with a scope, and currents calculated. This article reports the same equipment reversed so that the common mode choke is connected to the output of the MFJ-949E. The test circuit is an MFJ-949E T match ATU followed by A low Insertion VSWR high Zcm Guanella 1:1 balun for HF. 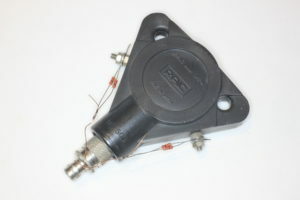 A banana jack adapter is connected to the balun output jack, and resistors of 50Ω and 100Ω connected from those terminals to provide a slightly asymmetric load. Hams are taken by fashion and pseudo technical discussion more than objective circuit analysis, experiment, and measurement. Nowhere is this more evident that the current fashion for “True Balanced Tuners”. 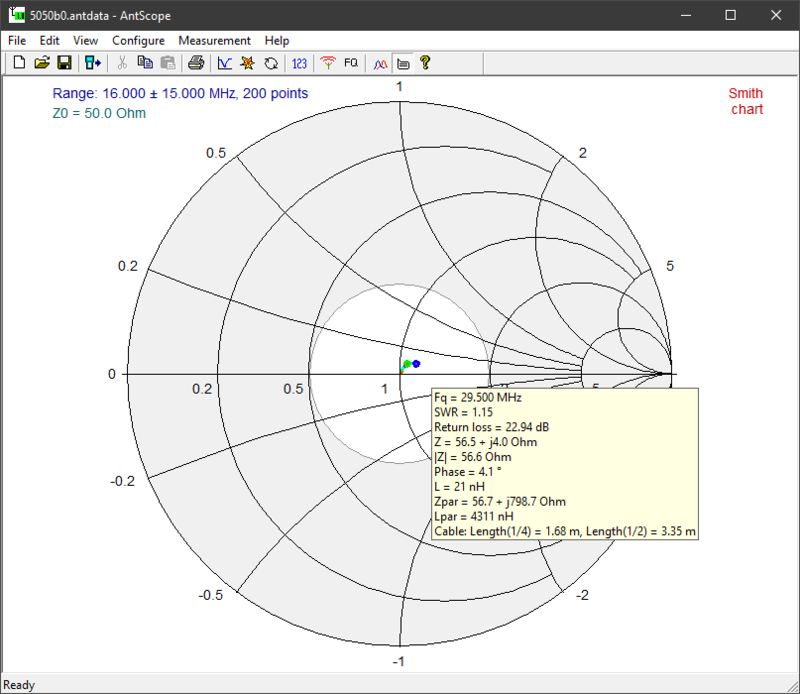 In recent years, interest in antennas that require parallel transmission lines has surged, spurring the development of new inherently balanced tuners. 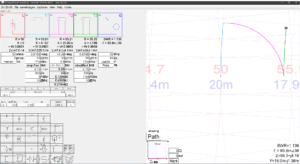 Open wire lines require current balance to minimise radiation and pick up, the balance objective is current balance at all points on the line. Cebik goes on to give examples of his “inherently balanced tuners”. I have been asked to expand on the calculation of voltage magnitude and phase set out in Voltage symmetry of practical Ruthroff 4:1 baluns. 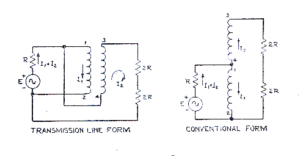 Above is Ruthroff’s equivalent circuit, Fig 3 from his paper (Ruthroff 1959). 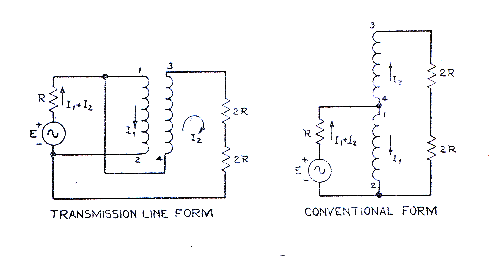 Focusing on the left hand circuit which explains the balun as a transmission line transformer (TLT), and taking the node 1 as the reference, the loaded source voltage appears at the bottom end of the combined 4R load, and transformed by the transmission line formed by the two wires of the winding, and inverted, at the top end of the combined 4R load. It is the transformation on this transmission line that gives rise to loss of symmetry. This article expands on the detail behind A low Insertion VSWR high Zcm Guanella 1:1 balun for HF with focus on InsertionVSWR and possible compensation schemes. 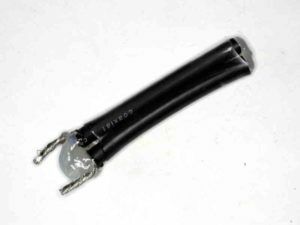 A low Insertion VSWR high Zcm Guanella 1:1 balun for HF – more detail #2 discussed the imperfection caused by the quite short pigtails, and although small, it is measurable. Chris, NX0E, related experience with Dr E M T Jones at TCI where they made, among other things, TCI’s HF baluns. These baluns were compensated using capacitors, and we see that very occasionally in ham grade baluns. The pigtails can be seen as a short transmission line of higher Zo, and although not uniform, it provides a model for understanding their effect. 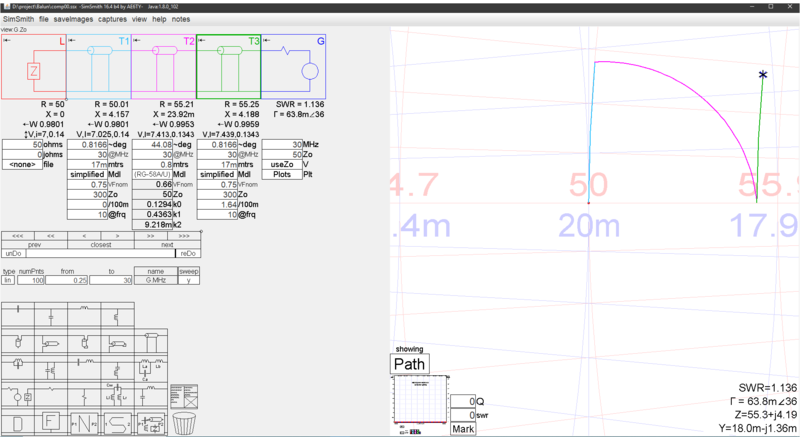 Above is a Simsmith model that treats the pigtails as short sections of 300Ω line, the lengths adjusted to calibrate the model to the observed impedance at 30MHz. 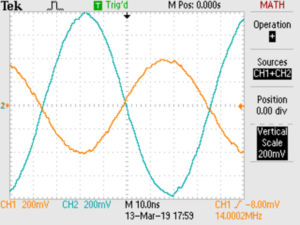 This article expands on the detail behind A low Insertion VSWR high Zcm Guanella 1:1 balun for HF with focus on InsertionVSWR. Insertion VSWR is the VSWR looking into the balun with a matched load (termination) on its output, it is a measure of imperfection of the balun. It ought to be a specification item for low Insertion VSWR baluns, but it rarely given. What is not mentioned in the above definition is the symmetry or balance of the load. 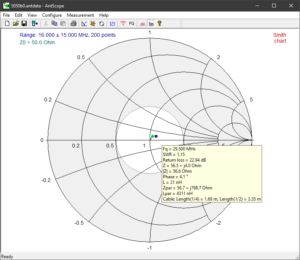 Above is a Smith chart plot of input Z of the balun with an isolated load of 50+j0Ω. 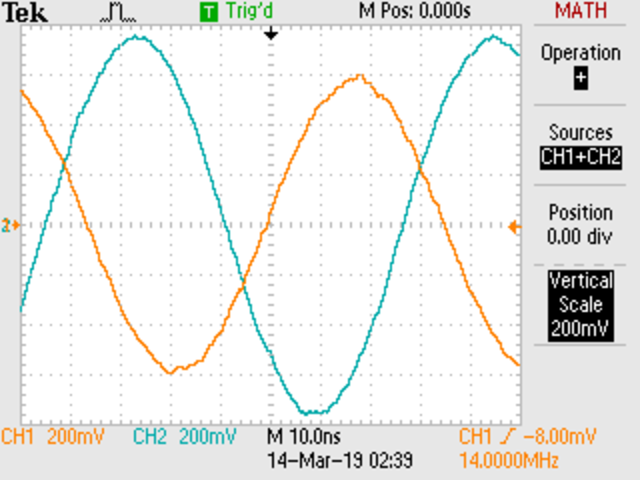 Isolated to mean that there is no direct path from either load terminal to ground, it could be seen as a symmetric load with extremely high common mode impedance. All of the external connections use N type connectors with Zo=50Ω.